I never really got into buying songs online. When iTunes Store first opened, I bought a few albums from it because I own an iPod, but very quickly I was deterred by the fact that I can't even play my iTunes purchases on my Squeezebox because of the DRM-protection. Annoyed by the situation, I subscribe to Rhapsody Unlimited, which let me cue up pretty much anything I want for a low monthly subsription fee of $12.99. When I find something I really want to own, I just go buy the CD and rip it to MP3 so I can play it anywhere. Just when I thought that there can't be anything better than 256k DRM-free MP3 downloads, I discovered Beatport yesterday. Beatport offers 320k DRM-free MP3! To top it off, it even offer WAV (16-bit 44 kHz) and 192kbps M4A! Little did I know, the site was actually launched in 2004, and the latest version as seen above was released in August 2006. 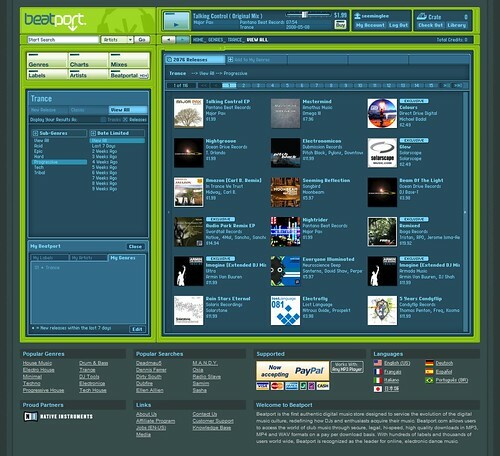 Beatport focuses on electronic music specifically, with an eye squarely focusing on DJs and electronica lovers. In other words, it's made for me. The content is top-notch, and I am able to get to a lot of remix tracks that I would not otherwise been able to get my hands onto if I were to browse on mainstream music sites (such as those described above).